"Career female pilots make up just 5 percent of the industry (business aviation and commercial). The challenges that female pilots face are multifaceted." 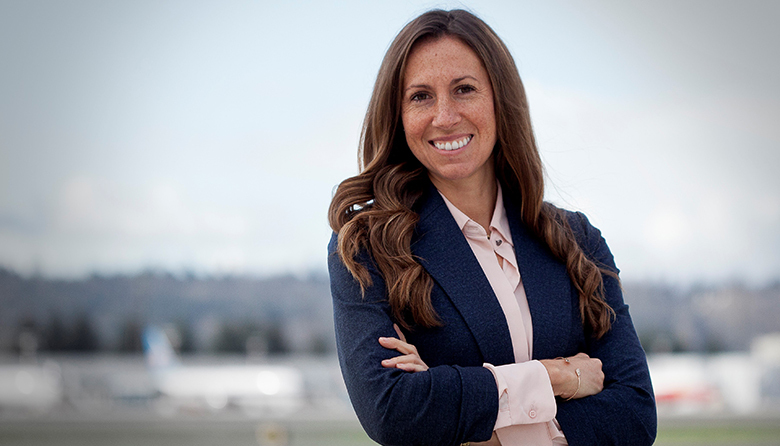 Seattle-based pilot Kimberly Perkins is this week’s Daring Woman. A captain at Mente LLC, she is leading the fight for the aviation industry to be more inclusive toward women. She is also the founder of Aviation for Humanity, a nonprofit that delivers school supplies and monetary donations to schools in need across the world. Read about her career high points, challenges she faced in the industry and how men and women can improve gender equity in the workplace in this week’s installment of our Daring Women Q&A series. I am a captain on a large private jet. There are many wonderful things about the job. One aspect I love is when I have an opportunity to support others in their journey to follow their dream of flying. I often find myself mentoring — formally and informally — quite a bit. I love to see when people morph through the stages of introductory flying to becoming a professional pilot. Aviation is an industry with a heavy focus on safety. If we were ultimately safe, we wouldn’t fly. Therefore, we are rewarded for taking risks. Business aviation has unique risks because a pilot is responsible for many facets of the trip, including flight planning, knowing what countries to avoid, acquiring ground handlers for fueling and airplane services, customs and immigration, visas, airport suitability research, landing permits, and aircraft performance calculations. These challenges are amplified when operating throughout developing nations; additional risks include security, fuel scarcity, infrastructure issues, and/or logistical hurdles. I feel extremely proud when my team and I oversee an around-the-world trip from creation to completion. Career female pilots make up just 5 percent of the industry (business aviation and commercial). The challenges that female pilots face are multifaceted. The societal and cultural norms that promulgate the antiquated image of women as the primary child-rearing parent create implicit and explicit biases that can make women feel unwelcome in the flight deck. Additionally, aviation has been and remains a good old’ boys’ club; therefore, networking and mentoring are intrinsically easier for men. Often, the only way to “address” these challenges is to ignore a rude comment, force a smile and do everything you can to make it easier for the next generation of female pilots. At a previous job, I flew with a senior pilot, Tim Dold, who was not specifically positioned to be my mentor, but I consider him one. He is an excellent pilot and very professional but knows how to have fun and make work enjoyable. He is lighthearted and a joy to be around. I looked up to him because he is well-respected in our industry and he’s progressive, inclusive and an ally for women. He taught me to not take myself so seriously. 1. Create your tribe of allies. 2. If you don’t already have it, grow some thick skin. 3. Know that at some point, you’ll fail (probably something small but maybe big), and, that is OK. Everyone has growing opportunities; get back up and keep learning. 4. Find the balance between confidence and humility. 5. Always pay it forward; make a path for the next group of daring women! Women need to move into leadership roles so they have an opportunity to set an example and give back to the next generation. Men need to make sure there’s room at the table for women and be sure their voices are not silenced. When members of the majority (men) support the minority (women), major progress can occur. Both genders need to make sure there are diverse candidates for a job. Nobody wants to be a token hire, but recruit in a way to ensure there are plenty of female candidates for a potential job opening. I have so many books that I love; it’s extremely hard to narrow it down. I often reflect on the book What Is the What by Dave Eggers. It’s based on a story of one of the many Lost Boys from Sudan. From the hardships of political conflict to the struggles of refugee status in a new country, the book shows how mindset can drastically alter one’s outlook on a situation. For the big stuff to the small, this is an important lesson throughout life. I create a group of people (my tribe) who find value in inclusivity and have a propensity for positivity. This group consists of female leaders, business owners, stay-at-home moms, and a select group of male allies. We lean on each other for advice and support. Everyone needs a tribe. Networking is extremely important. I am grateful for finding many opportunities through acquaintances while networking. You can expand your contacts by saying “yes” to those social outings, business collaborating events, and mentoring programs. And, say “yes” to volunteering! In my opinion, a good leader listens more than she talks. She leads by example and knows how to boost others up without the need for self-recognition. Overrated leadership traits include the need to be “powerful” or “harsh” or to elicit fear. The days of Machiavellian management are over. I wouldn’t have doubted myself quite so much. I held myself to an unreasonably high standard, which created unnecessary and unproductive pressure. It’s OK to not know something; I wish I had known that a decade ago. A working title: From 40,000 Feet: A Female Pilot’s Journey through Six Continents.